Our speaker's first formal introduction to black holes came from none other than the world famous physicist Professor Stephen Hawking. Dr Somak Raychaudhury began his talk "How to Find Black Holes" by emphasising that we are not in imminent danger due to black holes even though most science fiction films would have us believe otherwise. He stressed that they are not the cosmic vacuum cleaners that they are portrayed to be and that even if our Sun became one overnight the Earth would be safe from its grasp. In fact even the innermost planet, Mercury, would still be safely in orbit. Dr Raychaudhury considers there to be definitely two types of black holes, categorised as either stellar mass or supermassive objects. The stellar mass type has a mass in the range 3 to 100 times the mass of our Sun whereas supermassive black holes have millions or even billions the mass of our Sun. Some scientists have proposed the existence of intermediate mass black holes that have from thousands to hundreds of thousands the mass of our Sun but Dr Raychaudhury is somewhat sceptical. In theory anything can become a black hole if its mass is compressed enough. The Earth as a black hole would be a mere 2 centimetres across and our Sun would have a diameter of 4 kilometres. The concept of an object that we now call a black hole was first proposed by the geologist John Michell in a letter he wrote to the Royal Society scientist Henry Cavendish where he states "...all light emitted from such a body would be made to return towards it by its own proper gravity". This idea that even light fails to escape is encapsulated in the term "black hole" which was first publicly used by the theoretical physicist John Wheeler in 1967 but it had been used earlier in a letter to the American Association for the Advancement of Science. Although we cannot actually see a black hole we can measure some of its properties, namely its mass, charge and angular momentum. Perhaps its most defining feature is what is known as its event horizon that marks the boundary surrounding a black hole beyond which even light cannot escape. Although a black hole cannot be directly observed it gives away its presence due to its effect on its surroundings. For, at the centre of our galaxy, the stars are moving so fast in their orbits that the only possible explanation is the existence of a supermassive black hole with a mass of roughly 4 million of our Suns. The other giveaway of a black hole's presence is as surrounding gas and dust is pulled into its massive gravitational well. The material swirls inwards towards the black hole forming an accretion disc where frictional forces cause the temperature to rise and the release of radiation. 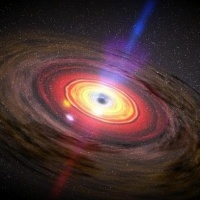 Some black holes also have what are known as relativistic jets that emerge at right angles to their accretion discs. These are narrow streams of plasma that travel at speeds approaching that of the speed of light. It is thought that they form as powerful magnetic fields associated with the accretion disc channel infalling matter outwards along the black hole's poles.